Versatility is the greatest asset of the Wusthof 8-pc. Gourmet In-Drawer Tray Set with Steak Knives and Bonus Sharpener. 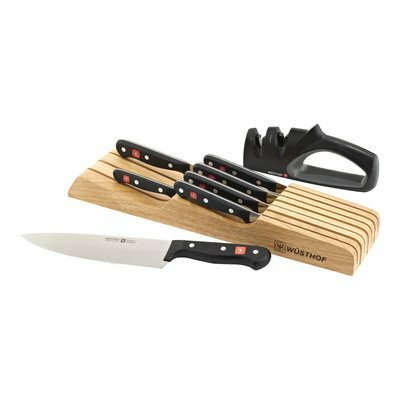 Containing everything you need to chop, peel, dice and slice, the set includes a 3-inch spear-point paring knife, an 8-inch bread knife and an 8-inch cook's knife and four 4.5-inch steak knives that provide a steakhouse feel in the comfort of your home. As an added bonus, Wusthof includes an easy-to-use two-stage sharpener as well as a low-profile wood tray with seven slots that provides safe and tidy storage for the entire set while protecting your favorite knives when they're not in use. Best Used For: The paring knife is ideal for delicate tasks such as peeling vegetables and fruit. Neatly slice bread and other baked goods using the serrated edge of the bread knife. The cook's knife excels at most chopping, slicing and dicing tasks, while the 4.5-in. steak knives are the perfect accompaniment to your flatware.